1912 was an exciting year to be alive. Technology was exploding with inventions like the telephone, automobile, and airplane becoming more and more common. Electricity was changing the way people went about their daily lives and the gramophone replaced the music box in family parlors. Europe was the romantic, idyllic travel spot for the well-heeled and no one could envision the horrors that a world war would bring in just two years. By now silent movies had matured from short Nickelodeon diversions to “photo plays.” The entertainment that had recently been deemed by many as immoral was becoming respectable as family entertainment. It was time for the motion picture to have its own home. Only two months later the new firm spent $100 on the lot at the southwest corner of 7th Avenue, St. Nicholas Avenue and West 116th Street. The natural choice for its architect was Thomas W. Lamb—already renowned for designing legitimate theaters. It would be a career-changing commission. Of the over 300 theater designs Lamb eventually designed, the majority would be movie houses. 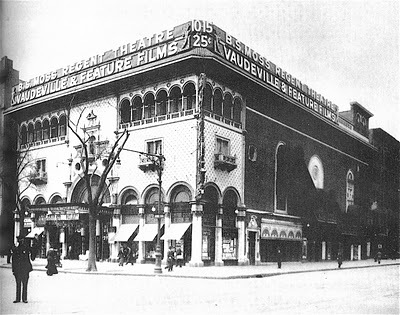 The resulting Regent Theatre, completed in 1913, was among the first, if not the first, monumental movie palaces that would flourish through the next decade. While drawing on the established form of the legitimate Broadway theater, Lamb used an exotic, romantic blend of styles to lure patrons to the wonders inside. Extensive multicolored terra cotta cast in Italian Renaissance, northern European and Mannerist styles exploded in exuberant arcades, loggias, balconies on a diamond-pattern base. The newly-opened Regent, before advertising would cover the parapet. The interior was lavish. Frescoes, ornate moldings and elaborate chandeliers took the movie goer from the street to a fantasy palace disconnected from the world outside. 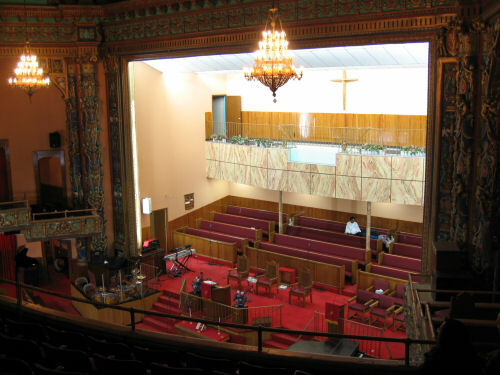 The auditorium with its loosely-styled “Spanish-Moorish” motif, was carpeted in dark blue below framed wall panels of brocaded satin. Artist Francisco Pradillo painted the grand mural above the proscenium arch, “The Surrender of Granada,” that enhanced the theme. The immense space could seat 1,854 patrons. Oddly enough, the Regent struggled. Within a year, Henry Marvin hired the flamboyant Samuel Lionel Rothapfel, later known simply as “Roxy,” as “director.” Roxy was already well known in the Midwest for his genius in accompanying music to the silent films. 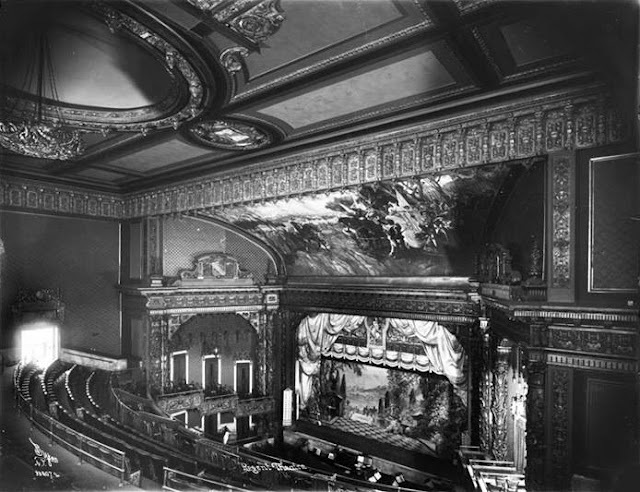 By December 1913 he had made some renovations of the interior—adding potted plants, changing details like the stage curtains and lighting—and was ready for the public. Roxy saved the day and the Regent thrived. In 1916 patrons were lured back week after week with serials that accompanied the feature films. One, that year, was The Strange Case of Mary Page. An advertisement in The Evening World enticed audiences. “You see Mary pursued by the ‘Brute.’ You see the lights and shadows of stage life. You see the tremendous court scene, without doubt the most thrilling and realistic trial found in the fiction of any country. You see Mary badgered by the prosecution—every man against her but one. The theater was used not only for motion pictures; but like other grand spaces, was leased for events. In June 1917 the “Jewish Billy Sunday,” Rabbi Herbert S. Goldstein held what he termed “a Jewish revival” meeting. Although police and firefighters said the fire had started in the basement of the theater, the manager, Joseph Connelly, insisted it was in an adjoining store. His version made for better public relations. A year later the Pansy Amusement Corporation leased the theater and would run the Regent for decades. In its 1937 lease extension, Pansy (now part of the RKO corporation), included television broadcasts. The same year air conditioning was installed and the theater could be opened year-round for the first time in its existence. The Regent Theatre Corporation, part of the RKO-Keith-Orpheum Theatres, Inc., purchased the theater in 1950. But by the 1960s the Harlem neighborhood had changed drastically. 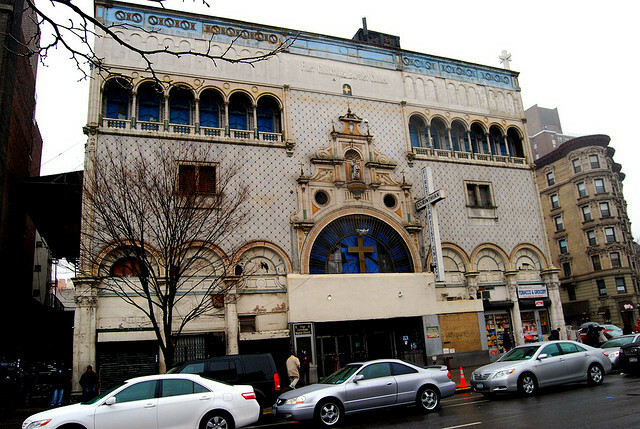 The 2000-seat movie theater was closed and the building sold to the First Corinthian Baptist Church on March 31, 1964. I drive past this theatre on the bus and am thrilled to find out it's history. Thank you!